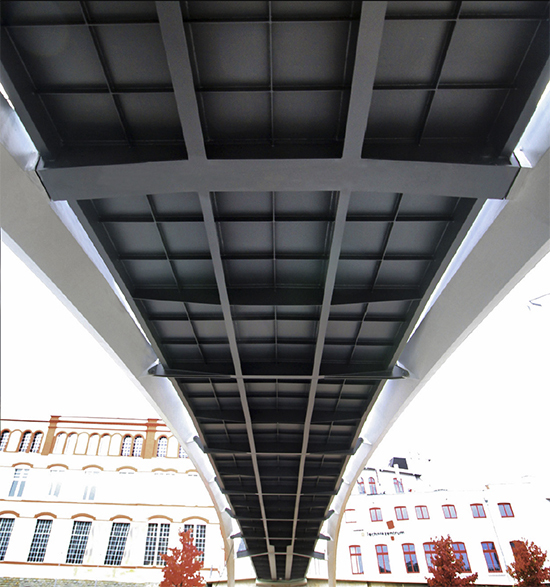 The clear structural diagram of DKFS' Museum Bridge is expressed in the details of the bridge throughout. The underside of the deck, clearly visible to users of buses and trains as well as the passer-by is recognized as a fifth elevation of the structure. Craftsmanship and structural engineering is obvious and can be enjoyed. While the two main shear links clearly express themselves and their structural relationship to the arch structure the hangers are simply pinned to gussets emerging every 4m from a transversal deck beams. They add to the exciting tectonic of the steel plate deck and underside of the bridge. The in section diamond shaped arches (squashed hexagon) vary width, height and steel plate thickness. The later had to be limited to 30mm to allow for effortless bending of plates as the resulting plates of the arch geometry have a subtle double curvature. Great attention to the way of prepping the plates has led to extraordinary sharp and clean leading edges of the arches making them a piece of art and astonishing craftsmanship in themselves. 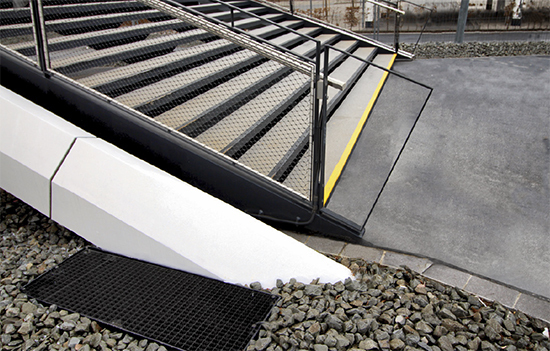 The balustrade is made of a frame system filled with black polymer coated stainless steel mesh minimizing visual interruption. It has been designed as a system which is made of a kit of parts that allows for the integration of elements such as conduits. All of the elements of the deck and lift structure are kept in black colour while the arch structure is white.